Our design teams have been lucky to work on some amazing projects helping brands improve the everyday experience of their products and services, from helping to design better patient experience in hospitals, to improving customer loyalty for a leading pet retailer. While our work is wide in breadth it has one common focus – it starts with putting people at the heart of the design process – an ‘outside in’ approach commonly referred to as Design Thinking. We start by ‘walking in customers shoes’ to gain understanding of their needs, wants and desires and then we ideate, prototype, and test possible solutions which ultimately results in a human centric experience, that benefits both the person and the business. More recently, our design teams have been applying this same approach to help solve workplace challenges, as I’ve referenced in my previous post. Working closely with Marketing, HR and Talent Acquisition (TA) teams, our projects have helped for example, helped shape brand identities, shine light on complex attrition issues, and bring insights to recruitment challenges. 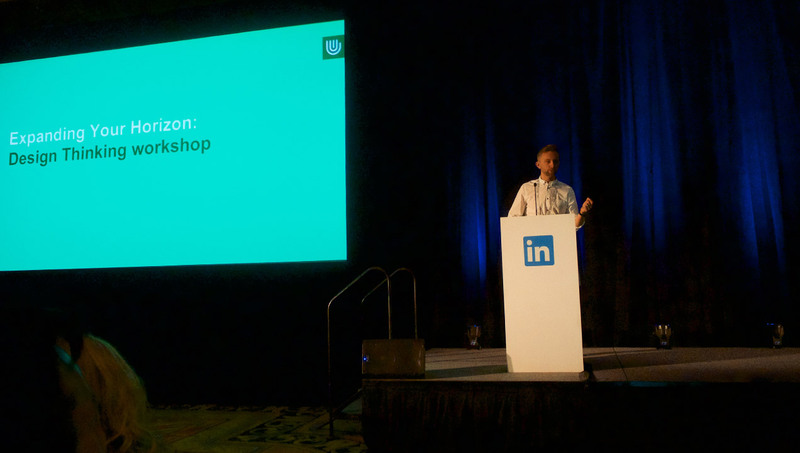 And it’s because of these workplace projects we were invited to speak at the LinkedIn Talent Connect 2016 in Las Vegas. With over 4,000 talent professionals attending, this annual event for the global talent industry is a hotbed for idea sharing and expanding the professional horizons. This year, we joined an impressive line up of keynotes speakers: Sir Richard Branson (Founder, Virgin Group), Jeff Weiner (CEO LinkedIn), Brian Fetherstonhaugh (Chairman & CEO, OgilvyOne Worldwide) and many from Netflix, Starbucks, Uber, GE Digital, Amazon, the list goes on. Research done by LinkedIn suggests that skills are being outdated at a faster pace than ever. 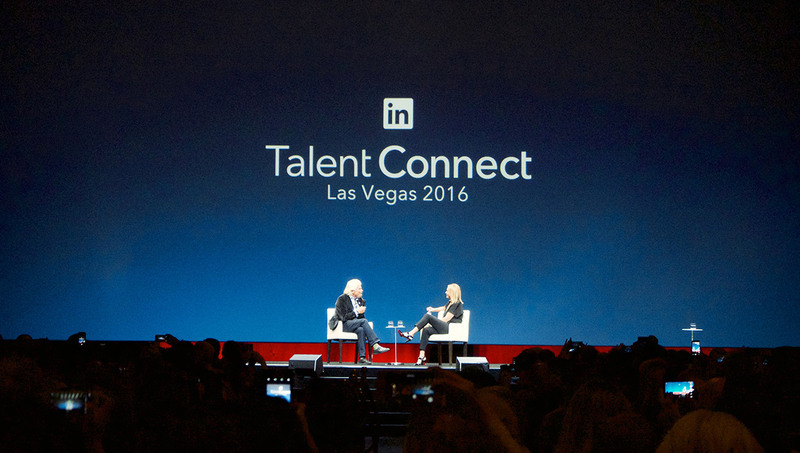 Jeff Weiner, for example, stated that skills acquired now could be outdated in 5 years. Another way to see this is that there will be roles in 5 years that don’t exist now. GE Digital as an extreme example, grew from a “family of 100 to a nation of 28,000” software engineers in less than five years. Organizations with big ambitions need to be smart by investing in talent brand to more authentic job branding attract talent but also have a talent strategy in place to support growth. Supply of good talent is getting more scarce (particularly in tech) and the war for talent is getting harder. Brian Fetherstonhaugh, talking on the future of work, said organizations need to become ‘talent magnets’ if they are to survive and there’s a debate amongst talent professionals on how to best solve these challenges. 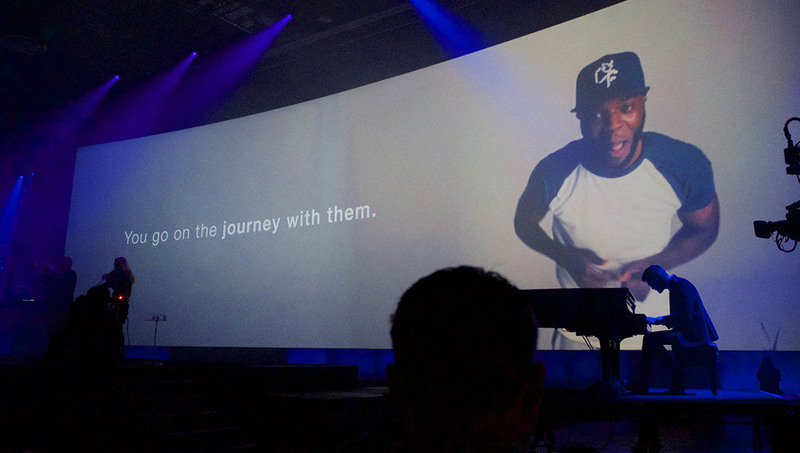 One camp believes higher ‘human touch’ is the answer, indicating that existing ‘transactional’ recruitment processes are dying, and more emphasis should be placed on deeper candidate engagement. The other camp is vouching for various forms of automation. Imagine an ‘interview-less job process’ as proposed by Danielle Monaghan, head of TA at Consumer – Amazon, where perhaps you are interacting with ‘Alexa’ (Amazon’s voice control system) who can perform assessments and at the end spew out a job offer within minutes (rather than days or weeks). We were invited as part of the ‘Expand your Horizon’ track, where we shared a case study on how we used Design Thinking to help our parent company, Sutherland Global (an outsourcing company) to better attract IT support professionals at their European HQ in Sofia, Bulgaria (a centre for young and bright tech talent). We shared the story of how, with limited time and budget, we experimented with new ways of approaching existing recruitment challenges by applying Design Thinking principles. Particularly how we used immersive research to ‘walk in candidates shoes’ to understand their journey throughout the recruitment process. We created behavioral personas, helping to segment, identify their ‘star’ target audiences and better understand their idiosyncrasies. We also created journey maps that gave a visual representation which help to articulate pain points and crucial insight that often lead to ideas for improvements and solutions. Considering our 5pm slot (our talk was the only thing standing between them and their first drink! ), we had a full room, an engaged audience, and a lot of interest to what I think is an emerging trend within business management – the application of Design Thinking to improve workplace experiences. We had many people approach us after the talk to ask questions, either ‘how can I do this within my organization?’ or ‘we are starting to do this, are we doing this the right way’? There’s no doubt that organizations who are growing or going through a transformation have to think differently to attract better candidates. Choosing a talent-centric approach to change can help organizations understand which strategy is best for them, and the people they are looking for.